Have a small or sick dog that just can’t handle the distance? Well, it’s common for dogs to run out of steam halfway through a walk. Putting your dog on a leash won’t be of any help in such a situation. There’s a new must-have accessory out there in case you’re an outgoing dog owner. This is none other than doggie strollers. There’s more to choosing the best dog strollers. You have to consider the right measurements, weight capacity, price/value, and the type of stroller that matches your dog. That’s exactly what we’ve done to come up with a list of the best dog strollers for your furry friends. Make those long walks easier on your pet with this dog stroller. The stroller comes lightweight yet still manages to be sturdy enough to support pets weighing up to 30 pounds. The seat is padded to cushion your pet during bumpy rides. Zippered closure and mesh screens allow easy access and improved ventilation. Cup holders are included to help you stay hydrated and refreshed. The stroller is no short of storage space, thanks to undercarriage storage that accommodates toys and snacks. It’s truly a multi-functional stroller to keep you and your pet healthy and active. This stroller is a nice addition to your list of cheap pet strollers. It’s fabricated from original plastic to ensure it holds up well for longer without cracking. Tough, water-resistant nylon fabric allows more flexibility at the joints. Mesh construction provides improved airflow and visibility on the go. The dog carriers support pets up to 30 pounds and folds in seconds into a space-friendly size. It’s fitted with undercarriage storage to accommodate some pet essentials. This pet stroller is one of the perfect travel companions you can have for your furry friend. 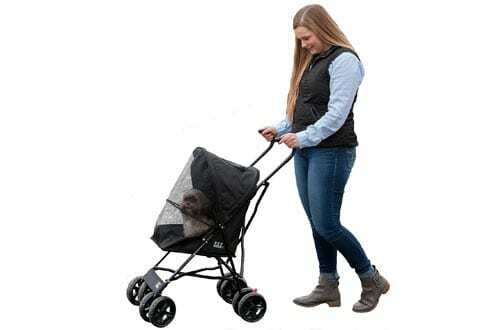 Your small pet might just love the look and feel of this stroller. 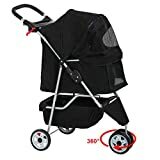 This stroller is one of the lightest in its class to save you a good deal of effort needed in pushing and carrying it around. It’s specially designed to accommodate small dog breeds of up to 15 pounds. This four-wheeler rolls easy and stays stable on many surfaces. It’s padded with a removable liner and has a mesh construction that keeps out bugs while providing a see-through ventilation feature. The stroller folds quickly for storage and transportation. It’s a perfect solution for saving your small pet the long walk. This pet stroller brings some new innovation into the world of doggie strollers. This is a stroller that ditches the zippered closure for a latch system. That means an easy time opening and closing the stroller. Your pet is awarded the convenience of a panoramic view made possible by an adjustable 3-position canopy. The dog jogging stroller has front shock absorbers that guarantee a smooth ride on bumpy surfaces. Beneath the canopy is undercarriage storage for the supplies you need. The stroller has a weight limit of 25 pounds. 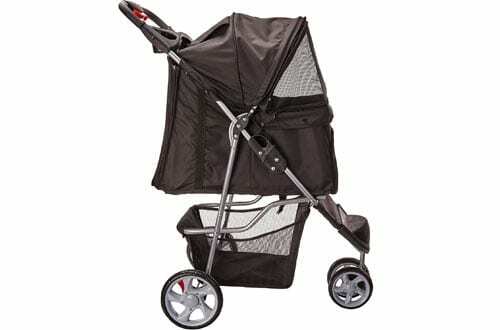 It’s one of the best strollers that raises the bar for others to emulate. 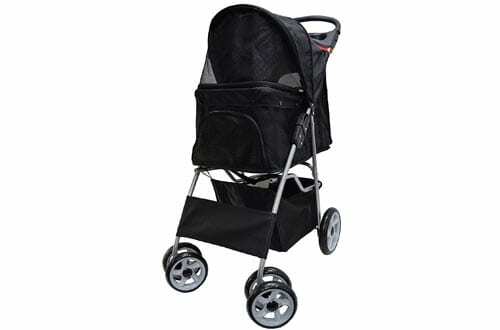 A perfect blend of comfort and reliability, this is pet carriage stroller that won’t disappoint anytime soon. It’s a lightweight haven on wheels capable of accommodating pets up to 30 pounds. There are two mesh screen windows that let you pet get a better view when sitting or standing. Below the canopy is a ventilated undercarriage storage to ensure that supplies remain fresh. Bumpy rides are made safe with padding that cushions your pet. 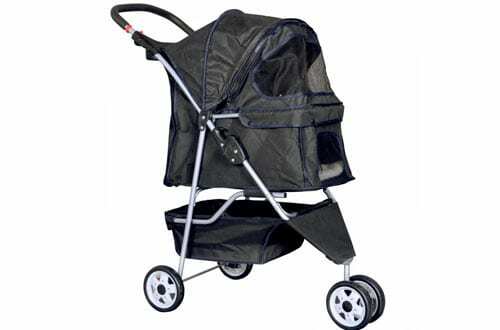 It’s a cleverly designed puppy stroller for sale that comes at a great price and great quality. This sturdy four-wheeler makes every roll smooth. 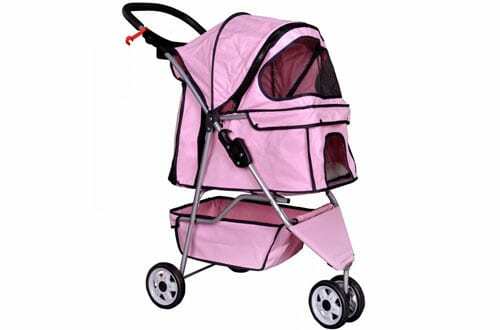 The dog jogging stroller comes with a sturdy built capable of supporting pets up to 30 pounds. A large protective compartment makes it roomy enough to accommodate two small dogs. 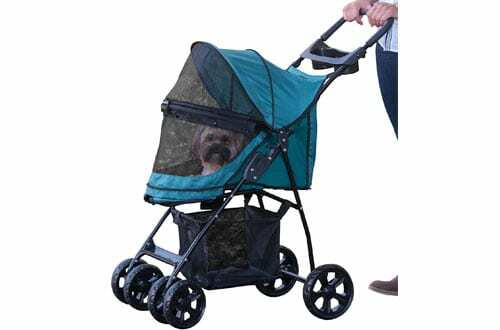 The dog strollers for small dogs have a generous mesh window space for improved ventilation and a better view of the surrounding. Underneath the canopy is a large basket that provides extra storage space. The small dog stroller folds into a compact size via a quick-release button mechanism. It’s a sturdy, durable stroller that is sure to last for long. 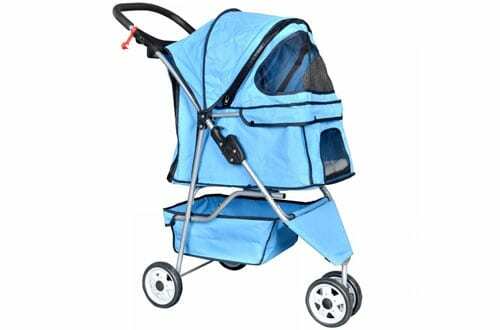 Oxford pet stroller is a fantastic choice for those that want an averagely priced dog stroller. With a capacity of 30 pounds, this stroller makes a great match for small dog breeds. 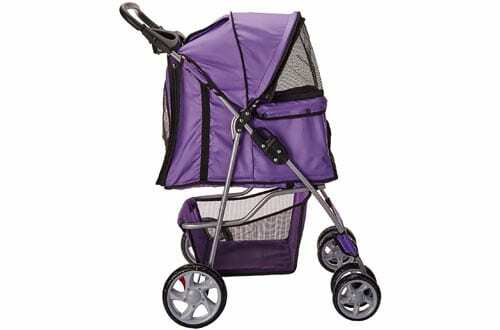 The construction is of high quality, a feature that makes it among the most popular doggie strollers out there. It has some features of great convenience, such as cup holders and a large storage basket for groceries and other supplies. The pet gear strollers collapse easily into a space-friendly size capable of fitting in a car trunk. The rain hood is retractable and there’s plenty of airflows provided by a ventilated mesh screen window. With this stroller, expect a solid performance for years to come. This dog jogging stroller comes at a fair price that will get your attention. It’s loaded with features that compare to strollers sporting a higher price tag. 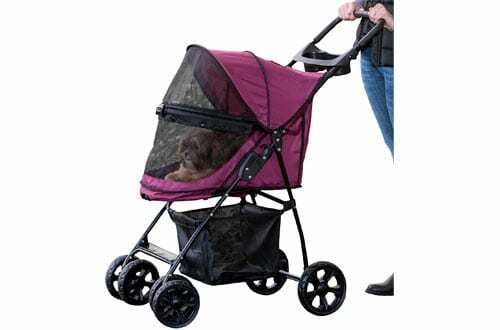 The stroller for a dog has a weatherproof nylon canopy that protects your pet from the elements. There’s a removable liner that provides a cozy feel and tons of ventilated space to ensure your pet gets the much-needed fresh air. A large storage basket is included to hold your treats and supplies while on the go. The stroller is an excellent purchase for small dog breeds weighing up to 30 pounds. Concerned about function more than cost? This small dog stroller will give you the quality you desire. 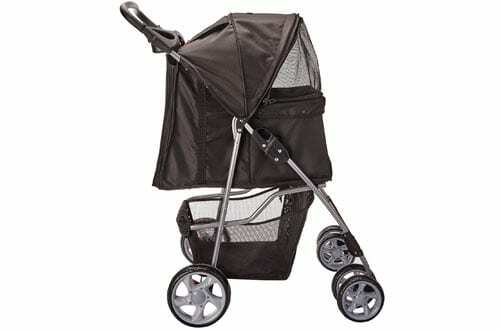 It’s among the most expensive but definitely worthy strollers from Pet Gear. The stroller doesn’t have any zippers to open and close. Instead, it provides the great convenience of a latch locking system. The cover used for the canopy is virtually weatherproof. A large mesh screen window and 3-position adjustable canopy come in handy to improve ventilation and provide a panoramic view. As per the manufacturer’s recommendation, this trails pet stroller holds large dog breeds up to 70 pounds. It’s a quality stroller that excels in every way. Choosing a dog stroller is among the top contenders in the lightweight category. It comes in a smooth plastic construction resistant to cracking. 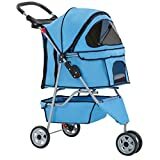 This pet stroller for 3 wheels is specially designed for cat and dogs weighing up to 30 pounds. It has all the comfort and protection that your pet needs while on the go. There’s a large ventilated canopy to let in fresh air and protect your pet from the elements. The stroller doesn’t disappoint when it comes to storage. It has a large undercarriage basket to accommodate your supplies and other essentials. These dog strollers will help save your pet from the worst cases of exhaustion and injury. There is much positive feedback from customers and we’re sure that you and your pet will live to love them. What are you waiting for? Make your selection and give your pet something to always look forward to.